Symptoms of upper gastrointestinal discomfort are among the most common patient complaints. Supporting the healing process of oral, esophageal, gastric, and abdominal tissues requires more than just treating symptoms. Deglycyrrhizinated licorice (DGL) is rich in flavonoids and chalcones, among other constituents, that favorably yet safely influence mucosal health by a number of mechanisms. Slippery elm bark contains a mucilage component with soothing properties ideally suited for protecting the tissues of the upper gastrointestinal tract. 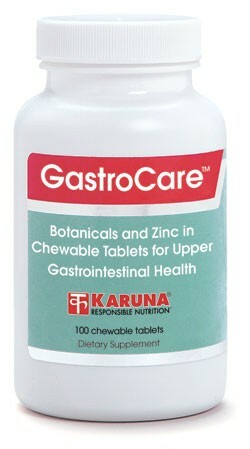 Zinc has several functions essential for healing disturbed tissues, including those of the upper digestive tract. These therapies are combined in a pleasant-tasting chewable tablet, since capsules do not allow the development of the soothing coating action required for maximal effectiveness. DGL has repeatedly demonstrated effectiveness in supporting normal growth and repair processes in the mouth and upper digestive tract according to controlled human trials (Gut 1985; 26:599-602; Gut 1982;23:545-51; Phytother Res 2009;23:246-50; J Contemp Dent Pract 2008;9:88-98). 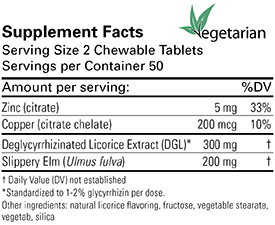 Suggested use for adults: Two chewable tablets 30 minutes before meals, three times daily, or as directed.